Are you in the picture? We think this is a school outing in Edwinstowe. 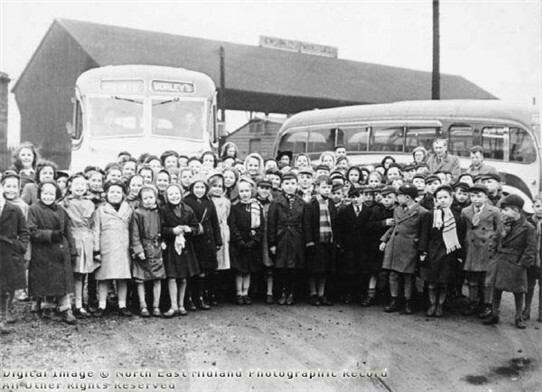 Are you one of the children in the picture, or do you remember Morley's buses? If so, please leave your information via the 'Comment' link at the bottom of this page. Thank you. This page was added by Website Administrator on 03/09/2013. On the SCT'61 website there is a photo from 1963 of an AEC Monocoach (registration SAL 55) which says it was bought new by Morleys of Edwinstowe. With my comment above that puts the operational dates for the company as stretching from at least 1963 to 1975-76. Does anyone else know any more about Morleys?